CWD is a fatal disease that has been discovered in white-tailed deer, mule deer, and elk in localized portions of Texas. To detect and manage this disease, the department has designated CWD zones. Hunters who harvest mule deer, white-tailed deer, elk, or other CWD-susceptible species within the CWD Zones are REQUIRED to bring their animals to a TPWD check station within 48 hours of harvest. Hunters must check each animal harvested and receive a CWD receipt before taking any part of that animal from the zone, including any meat or quartered parts. Additional regulations may apply, and additional zones may be established without prior notice upon discovery of CWD. The department will make every effort to publicize the designation and location of CWD zones and check stations, as well as any special regulations that may be adopted following the publication of this notice. For the latest updates, call or (800) 792-1112, or visit the CWD information page. A hunter who harvests a CWD-susceptible species outside a CWD zone and wishes to have the animal tested for CWD should contact a wildlife biologist in that area. 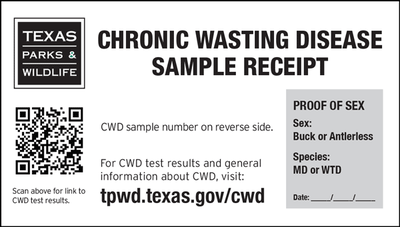 As an alternative to TPWD check stations, a list of Texas Animal Health Commission (TAHC) Certified CWD Postmortem Sample Collectors who are also TPWD-approved is provided on the CWD information page. Please report any symptomatic CWD-susceptible species to TPWD.